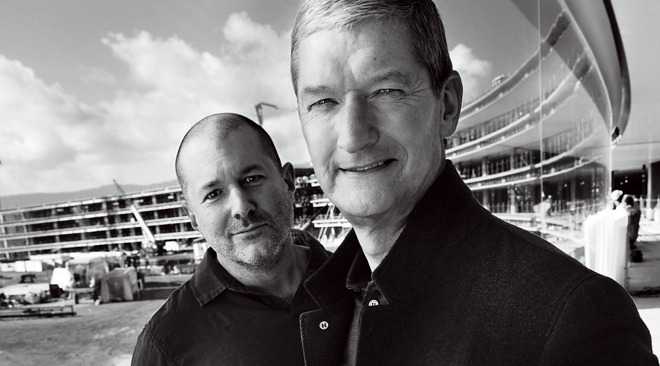 Apple Chief Executive Tim Cook and lead designer Jony Ive took fashion magazine Vogue on a tour of their upcoming "spaceship" Campus 2, and explained how the Apple Watch is the realization of a long-term goal for the company. Credit: Mario Testino for Vogue. In the interview, Ive explained how Apple's internal goal has always been to make highly personal technology that users form a bond with. For him, that dream is becoming a reality with the introduction of the Apple Watch last year. "Nine years ago, the iPhone didn't exist, and the most personal product we had was too big to carry around with you," Ive said. "The technology is at last starting to enable something that was the dream of the company from the very beginning— to make technology personal. So personal that you can wear it." The feature also delved into how the fashion world has responded to Apple's foray into their realm. In particular, Apple's partnership with Hermès for a new Apple Watch design is indicative of the types of partnerships that are new territory for the Cupertino, Calif., company. The profile revealed that Apple will sponsor "Manus x Machina," an exhibition at the Metropolitan Museum of Art's Costume Institute. In addition, Ive will serve as co-chair of the opening night event. For the interview, Ive and Cook took Vogue on a tour of the upcoming "Campus 2" corporate headquarters. Cook boasted that all of the dirt dug up for the construction will remain on the property, which will feature more than 7,000 trees. "In what we do, design is crucial," Cook said, "as it is in fashion." Though Apple has maintained secrecy about its upcoming product pipeline, officials at the company have been more open and accessible under the reign of Cook— a marked change from the company's public relations strategy under his predecessor, company co-founder Steve Jobs. For example, Cook and his team took part in an extensive feature for CBS's 60 Minutes in December. In addition to media interviews, Cook has also advocated on behalf of social and environmental causes, including diversity, equality, and green energy initiatives. His work earned him the Robert F. Kennedy Human Rights "Ripple of Hope" award last year.